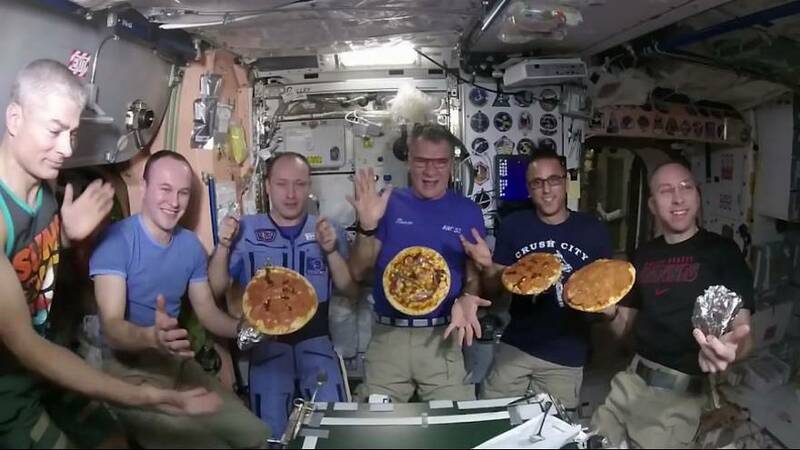 Space chiefs have kept Italian astronaut Paolo Nespoli happy by sending him and his crew some pizza. Nespoli, 60, Europe’s oldest astronaut and on his third trip to space, casually mentioned he was missing Italy’s most famous export during a live link. A supply spacecraft in mid-November brought all the necessary ingredients: sauce, cheese, pepperoni, anchovy paste, tomatoes and more. Now NASA has released a video showing the crew aboard the International Space Station tucking into their treats. It shows astronauts playfully using the lack of gravity to spin the pizza on their fingers and pass them in front of the camera. NASA says in the early days of space travel astronauts had to rough it: food came in dried cubes or was served in toothpaste-like tubes. Now, according to the agency, food in space is much more as astronauts would expect to enjoy back home.